God's greatest blessing is family. 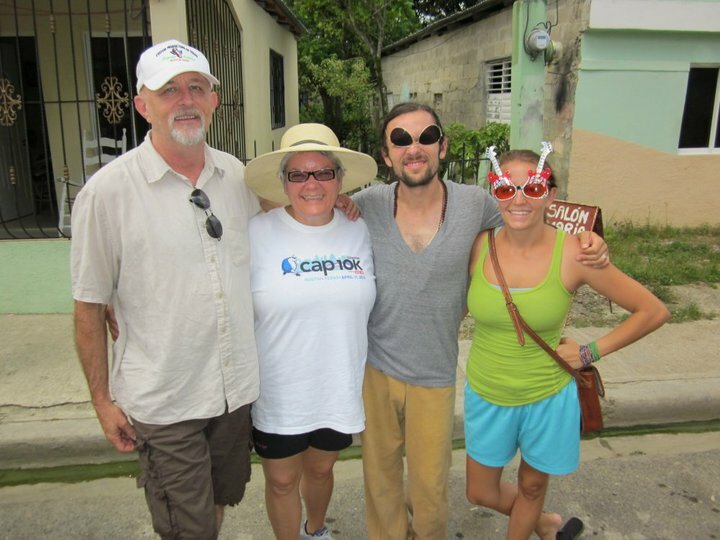 The Welch's - Michael Don, Barbara Jane, Jonathan Michael and Cara Jane Visit 2010 to see Cara Jane in the DR! "The angel said to the women, "Do not be afraid, for I know that you are looking for Jesus, who was crucified. He is not here; he has risen, just as he said. Come and see the place where he lay. Then go quickly and tell his disciples: 'He has risen from the dead and is going ahead of you into Galilee. There you will see him.' Now I have told you." Mary Magdalene and another Mary were on their way to the tomb to prepare Jesus's body for burial. Because of the time of Jesus' death...His body was placed in the tomb...but it was not given the proper burial as was tradition. These ladies were on their way to achieve that task. I wonder what if Mary & Mary simply had decided not to go back to the tomb and prepare His body. What if they had sat down and said..."What's the use?" What if they had just given up? What if they had just thrown up their hands and said..."I don't care anymore, He is gone and I have no hope of a Savior!" Whether or not they were tempted to, I'm glad they didn't quit. That would have been tragic. You see they thought they were alone. They weren't alone though...they thought their journey was going unnoticed. That was not the case...God knew! He was watching them walk up the mountain. He was measuring their steps. I can just see Him smiling at them...thrilled at their devotion. And He had a surprise waiting just for them! Why did the angel move the stone? What reason did he really roll the rock away? For Jesus? Well when I truly think on this question..I know in my heart it was not so Jesus could come out...it was so these women could look in! Think about it...does God really need to move a rock so Jesus can come out? Did the stone have to be removed in order for Jesus to exit? Was the conqueror of death so weak that He couldn't do that for Himself? The one who healed the blind...and brought Lazarus back to life again, you really think He couldn't come out unless someone moved the stone? These verses tell us that Jesus was already out when the stone was moved. Read it again...verse 6 says, "Come and see the place where he lay." The stone was not moved so Jesus could come out...but so that these women could see in! Our Scripture goes on to say in verses 7 & 8, "Then go quickly and tell his disciples: 'He has risen from the dead and is going ahead of you into Galilee. There you will see him.' Now I have told you." The two Mary's don't have to be told twice...they look and see that their Savior is not there and turn to tell the others...the Good News! Now I want to just think about my Savior's joy for a moment. I know He takes great delight in giving precious gifts to those He loves. Those who know Him as a personal Savior. In verses 9 & 10 Jesus meets them and says, "Greetings," he said. They came to him, clasped his feet and worshiped him. Then Jesus said to them, "Do not be afraid. Go and tell my brothers to go to Galilee; there they will see me." The God of surprises strikes again. It's as if He can't wait any longer. I can hear Him say, "They came this far to see me...I'm going to drop in on them so they can rejoice and have full joy!" I know when I have a gift for my husband...or my children...I really can't wait until they open the gift! I want to help them untie the ribbon...and tear open the paper. I can just sense that this is the same excitement of Jesus that day! Because see my Savior is a God of love and mercy...God does that for the faithful. Just when the womb gets to old for babies, Sarai gets pregnant. Just when the failure is too great for grace, David is pardoned. And just when the road is too dark for Mary and Mary, the angel glows and the Savior shows and the two women will never be the same. The lesson? Three words, "Don't give up!" Is the trail dark? Don't sit. Is the road long? Don't stop. Is the night black? Don't quit. God is watching for all you know right at this moment He may be telling the angel to move the stone. God still sends His angels...and God still moves stones! But there is one more thing God does in this chapter of Matthew...He gives the "Great Commission" to His followers. Matthew 28:18-20 says, "Then Jesus came to them and said, "All authority in heaven and on earth has been given to me. Therefore go and make disciples of all nations, baptizing them in the name of the Father and of the Son and of the Holy Spirit, and teaching them to obey everything I have commanded you. And surely I am with you always, to the very end of the age." So I have to ask you, "What does the Great Commission mean to you? Has it made a practical difference in your life?" There are so many opportunities to serve in God's Kingdom. Take a moment and seek God's direction for what that means to you. Ask God for wisdom to understand where you fit in to His plan. "We proclaim him, admonishing and teaching everyone with all wisdom, so that we may present everyone perfect in Christ. To this end I labor, struggling with all his energy, which so powerfully works in me" (Colossians 1:28-29). I love you and pray God's grace to you...that you may look in the tomb and see the real victory! We have now have a Non-Profit called SPERO Ministries. It is a fund raising organization the helps support our daughter on mission in the Dominican Republic. It also supports the local community through Helping Hands. My main reason for posting this information right now...is Cara Jane is seeking funds for her mission in the DR. She is being lead by God to build a building for the women of La Tienda and their Coop. Please take the time to pray how you can partner with God's work through Cara Jane. We pray that God will bless you as you walk this journey of love with us. If you have a prayer request you would like me to know about...please post it here. I would consider it an honor to go the Heavenly Father on your behalf. "And pray in the Spirit on all occasions with all kinds of prayers and requests. With this in mind, be alert and always keep on praying for all the saints" (Ephesians 6:18). "But those who hope in the LORD will renew their strength. They will soar on wings like eagles; they will run and not grow weary, they will walk and not be faint. You’ve been with me on this journey for three years now, starting with my first one-week trip to the Dominican Republic. I give thanks to the Lord for how he has used each of you to carry me all this way. It has not been easy, or simple, but my life here has been made possible. God has given me hope in the manifestation of His power. Once again change is happening in my world here. My dear friend Robin, who has been with me since the beginning is leaving back to the states. And another friend Ashley that has been here two years is leaving as well. The constant change adds to the difficulty of living far from my family and comforts, and this time I feel it will be the most difficult. I’m gearing up for what I feel may be my last year here. Pray for me that God would continue to show me what I can live without and how I can use every blessing to love others. I spent the past year working with a friend from Canada, Rachel Sticklee, among a cooperative of women called La Tienda. Rachel started the coop as a means of work for women that would provide dignity and keep them from resorting to other unacceptable means of finding money. It has been a joy this year to see how working creatively has improved the quality of their lives. We began the year with the hope that we could create a system of independence for the women. We opened bank accounts; we’ve started teaching them where to buy and how to prepare supplies. We’re nearing the end of a construction project. We were given a 100 year lease of our building, which was such a blessing. So we started making improvements. Now we have a huge storage room where materials for work can be prepare, stored, and sought. Currently I have been gathering information for each item that we make, how much of each material is used, which ladies do what parts. Everything will eventually be translated into Spanish so that the women can use the information to prepare and make their own work, and then fill orders that will be sent to Canada and the US. Our hope for this year is to do a trial run with the women running the art coop independently, working out all the kinks, and then preparing ourselves for the next step. Pray. In the past three years I have spent here one thing is certain, any and all successes are because of what the Lord has done. He gives me strength each day to face the challenges ahead. Please consider partnering with me once again on this journey that God has begun and will complete. I am working freelance under a new non-profit, Spero Ministries. My goal for now is to raise enough support for this next year at $1000/m, as of now I have enough to get me through August. Spero will be sending me 100% of the support that I raise to go towards my living expenses and needs. Checks can be made out the Spero Ministries and sent to 2002 Aster Way, Round Rock, TX, 78665 along with a note indicating that the money should be applied to my support. For information about La Tienda visit latienda.ca, and for information about Spero Ministries contact mikedonwelch@gmail.com.